Growing your own vegetables and fruit must be one of the most of the most satisfying pastimes. To be able to grow something that you will nurture until it has grown and then to present it to your family as part of a healthy meal is indeed something to be proud of. Growing food in your garden is a simple as buying bulbs, plants or seeds putting them into the earth and watering them until the food arrives. Of course some ‘know it all’ will tell you that there is a science to it – yes there is if you want to grow giant marrows, compete at the Chelsea Flower Show or try to usurp Alan Titchmarsh. For the rest of us who want to put food on our table, growing vegetables is very straightforward. There are loads of television programmes advising on how to cultivate our gardens and also books that accompany the series. These will tempt those interested in gardening and you can follow the instructions step by step. Speak to family and friends as they may well be experienced gardeners and try to pick their brains over what to grow and when to plant it. Take a look at your neighbours gardens as whatever they are growing should do equally well in your plot. You will need to clear your vegetable plot of weeds and garden waste and dig it over well. Depending on the type of soil, dig in plenty of manure before planting your crops. Check to see what parts your garden are in the shade and before planting out your seedlings check on the instructions that the place where you want to site them is ideal for the purpose. If you only have a small garden or perhaps just a yard, patio or balcony why not try your hand at growing a few vegetables in pots and grow bags? 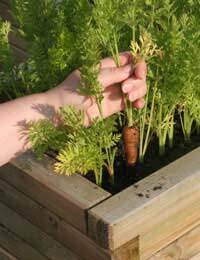 Tomatoes, beans and peas not only look pretty in pots but carrots in deep pots or tubs will supply plenty of fern like fronds and can be very attractive. Turn all of your garden and kitchen waste into compost, it is simple to do and will benefit your garden in next to no time. Purchase a compost bin (some local councils have special rates or give them away free to council tax payers) and start to fill it with grass cuttings, food peelings, old teabags etc and keep it covered so that it does not dry out or get too wet in the rain. Before long the centre of the compost will start to get quite warm and the material will begin to rot down. If your compost waste is slow to start working you can purchase a starter liquid to get it going. Keep topping up your compost bin and when it is ready remove compost for your garden from the bottom of the bin through the specially designed openings. Items such as plants, seeds, rakes and spades can be quite costly. Look for second hand equipment in the free ads or ask for them at Christmas and birthdays from family. Seeds and plants can be obtained by cuttings from other gardeners and bought in trays at bring and buy sales etc. Once you are into growing your own fruit and vegetables you may wish to expand your growing area. Most councils own allotments that are rented out to people living in the area at a very moderate fee. Why not add your name to the waiting list now as it could be at least a year before one becomes available. Growing things in your garden could become a new hobby and if it encourages you to extend your hobby why not join a local gardening club? With speakers and trips to gardens of interest you will soon learn more about your new interest and meet like-minded people.